Best Film, Director, Actor. 8 other award wins, 30 nominations. 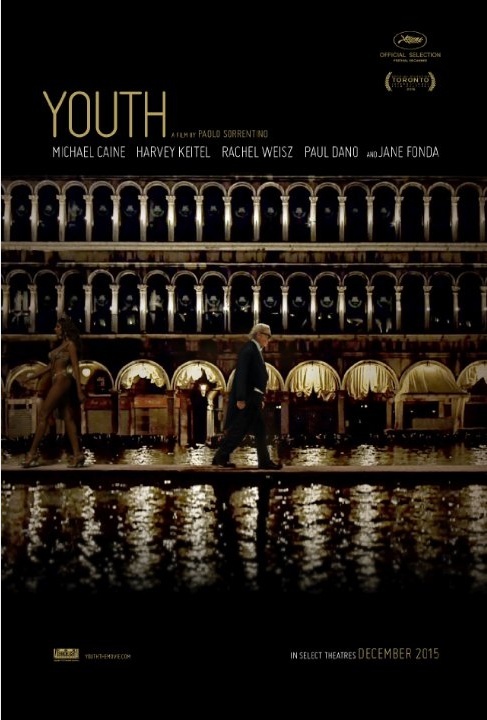 A wry meditation on aging, Paolo Sorrentino’s latest film Youth features sumptuous photography and music score, and serene portrayals by Michael Caine and Harvey Keitel as two lifelong friends who have different ideas about how to spend the remainder of their lives. Fred (Caine) is a retired composer and orchestra conductor whose beloved wife is living in an institution in Venice. Fred is content to have left public life behind him, even declining the honour of conducting one of his compositions for the Queen. The reasons for this, eventually revealed, are particularly touching. By contrast, Fred’s best friend Mick (Keitel), a film director, is still active, planning a movie with a quartet of young writers. They’re all staying in a hotel in the Swiss Alps where Fred’s distraught daughter, Lena (Rachel Weisz), also visits, having been abandoned by her husband, Mick’s son, for a younger woman. involving Jane Fonda as a fading movie star that makes a potent comment on the passing of time. The finale is glorious, both musically and dramatically. As a universal story of how to deal with the passing of time and life’s changing circumstances, Youth is told with precision and tender serenity.